In Japanese, I found an entry for 吟味 (ぎんみ) which means “testing; scrutiny; careful investigation.” I guess a name like that could be comforting in a country so beset with food safety issues? I found it interesting how the mouth radical (口) is used in the same logo to form two very different pictures. The first one is of a table reminiscent of ancestral forms of the character 口, except upside down. 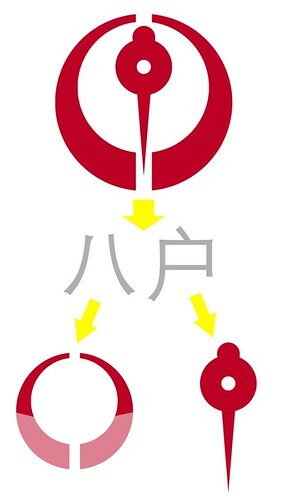 The second one looks like a bowl, and although looking more modern, resembles a few of the other ancestral forms of the character 口 (and not upside down this time). 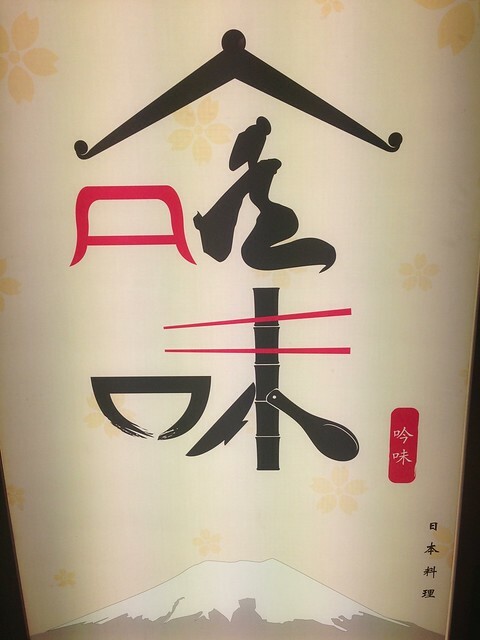 The right side of 吟 (the roof combined with the kneeling Japanese figure) to me really looks more like the character 令 than 今 in certain calligraphic styles. 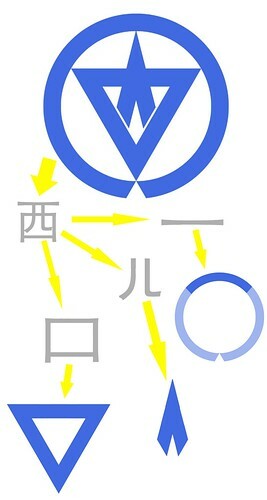 Logos like this are interesting, but to me highlights an important point: Chinese characters are not pictures. They’re not even very much like pictures. 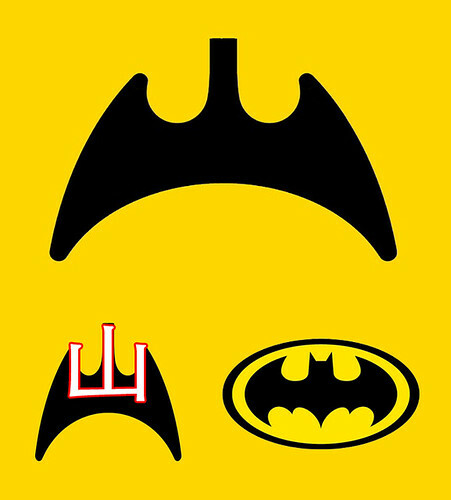 If characters were really “like pictures,” this kind of logo wouldn’t work. Certain Chinese characters and character components are historically pictographic in nature, yes, but you can see how even a basic pictographic element like the mouth radical (口) is actually very plastic. To me, what’s so fascinating about characters is not that they’re “like pictures,” but that they’re a ridiculously complex (and yet still viable) alternative symbolic system to alphabet-based writing systems. I’ll write more on this subject later. 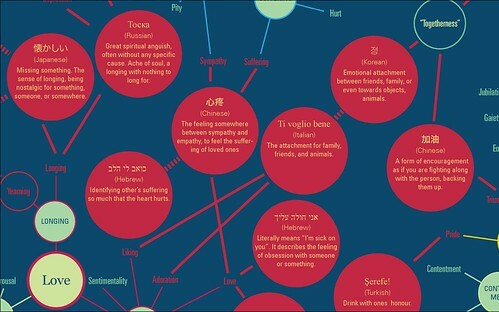 > 心疼: The feeling somewhere between sympathy and empathy, to feel the suffering of loved ones. Literally, “heart aches.” This one isn’t too hard to understand. 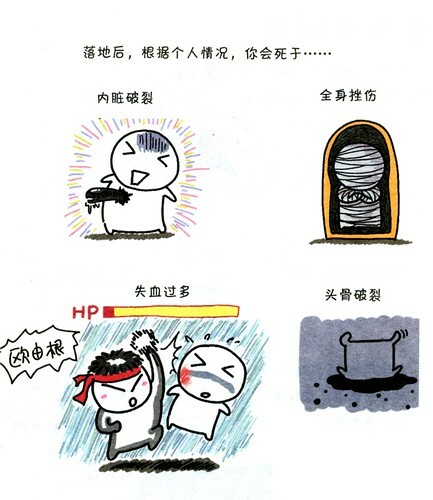 > 加油: A form of encouragement as if you are fighting along with the person, backing them up. > 忐忑: A mixture of feeling uneasy and worried, as if you can feel your own heart beat. > 纠结: Worried, feeling uneasy, don’t know what to do. 纠结 probably gets my vote for “newest super useful slang word that you won’t find in a textbook,” but it’s not just a word-fad that’s going away anytime soon. > 懐かしい: Missing something. The sense of longing, being nostalgic for something, someone, or somewhere. 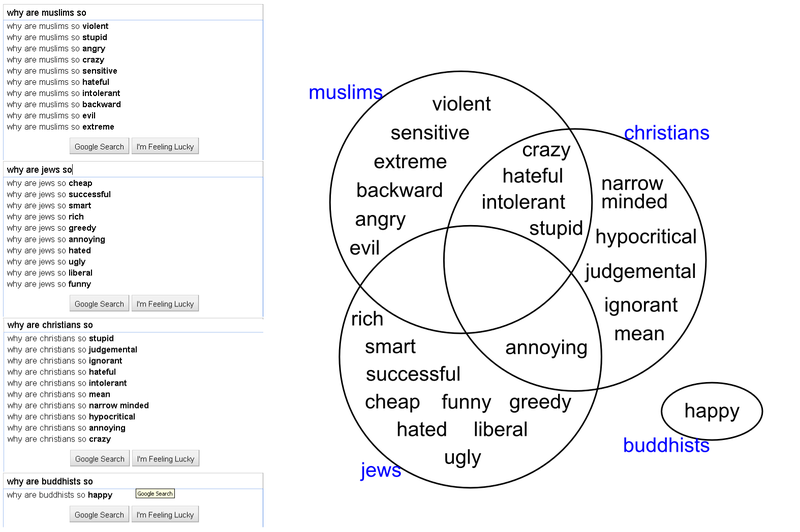 I was recently introduced to the awesome Google Suggest Venn Diagram Generator by Micah. Some interesting suggested searches by Google were crossed with a Venn diagram by some creative soul, and then the process was automated on the web by request. The result is a unique way to visualize and compare the data indexed by Google. 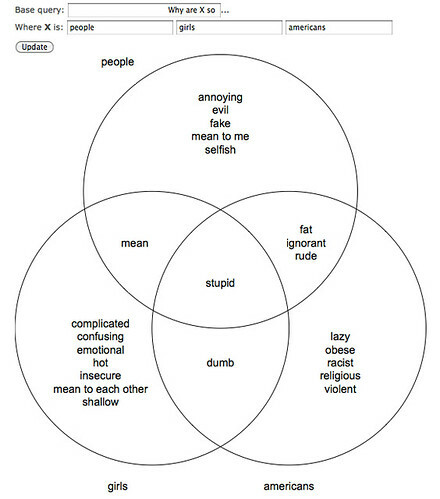 So we can see from this graph that according to Google, lots of people are asking (or telling) why both people and girls are mean, why girls and Americans are dumb, and why people, girls, and Americans are all stupid. Yikes, “how does Chinese water torture work“? Gotta love the intellectual curiosity. 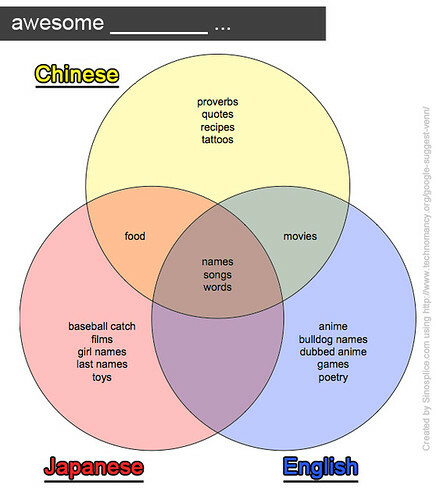 I like the “how does English sound to foreigners” question though. Ah, yes. But we expected that. 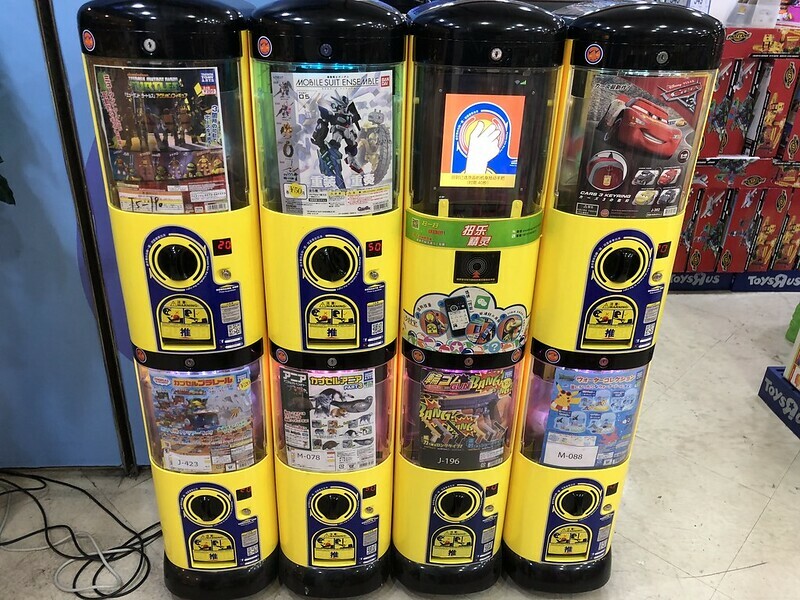 Pink Tentacle recently did a post showcasing Japanese town logos which make prominent use of kanji (Chinese characters in the Japanese written language). These designs totally blew my mind. 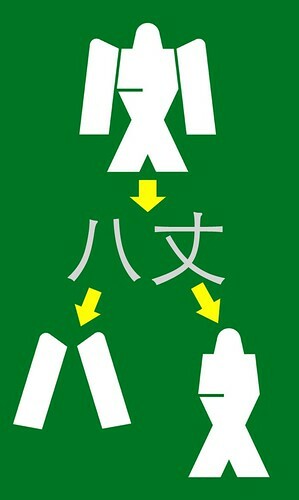 I love seeing creative manipulation of Chinese characters, so this stuff was pure gold. 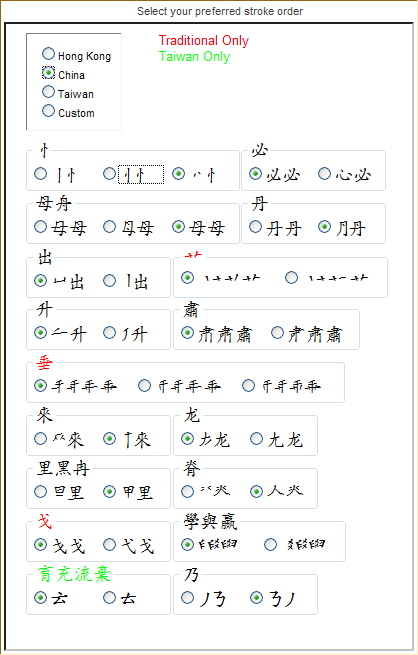 Be warned, though; some of these are a bit hard to make out if (1) you don’t know what character(s) you’re supposed to be looking at, and (2) you don’t have significant experience with Chinese characters. Below I’ll explain a few of the designs to make them a bit more accessible. This next one is actually two characters, but both are fairly easy to recognize (they’re just a bit chubbier than usual), and they have the added benefit of resembling a Japanese robot! Nice. Two characters again (八 returns! ), but this time a decidedly asymmetrical character is forced into a symmetrical design, with interesting results. Now we’re getting a little crazy. This very stylized logo turns a line into a circle and a box into a triangle. It takes a bit of mind-bending to see it. This one is probably my favorite (overlooking any similarity to the logos of past fascist regimes). So it turns out learning character components can have interesting applications after all. Be sure to check out all the other logos on Pink Tentacle. There are plenty more good ones. 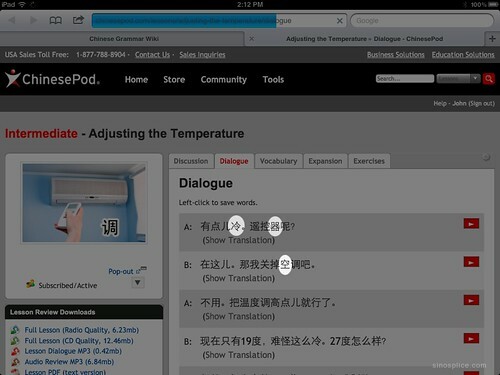 Translation Party is a website built using Google Translate. 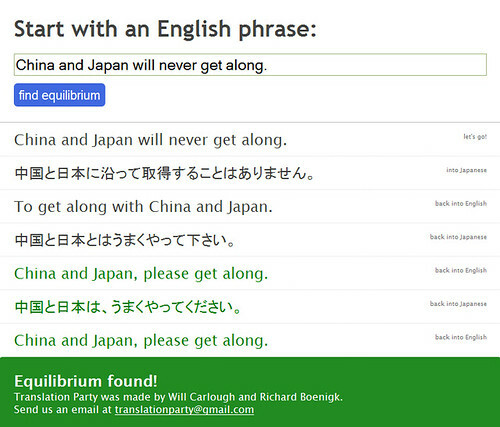 The idea is to take an English sentence, translate into Japanese, then back into English, and keep going back and forth until an equilibrium is reached and the translation stabilizes. I knew Google’s motto is “don’t be evil,” but I didn’t expect that to result in translations that lecture (politely). Still, pretty cool. Anyway, I recommend you play around with Translation Party. 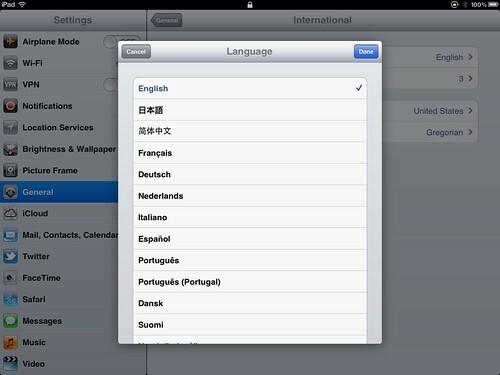 It’s a very simple concept; would love to see it done in more language combinations (especially Chinese to English!). “Reduplication, in linguistics, is a morphological process by which the root or stem of a word, or part of it, is repeated” (Wikipedia). You see reduplication in Chinese a lot, with verbs (看看, 试试), nouns (妈妈, 狗狗), and even adjectives (红红的, 漂漂亮亮). You get reduplication is Japanese too (some of the coolest examples are mimetic), in words such as 時々 or 様々. As you can see, rather than writing the character twice, the Japanese use a cool little iteration mark: 々. 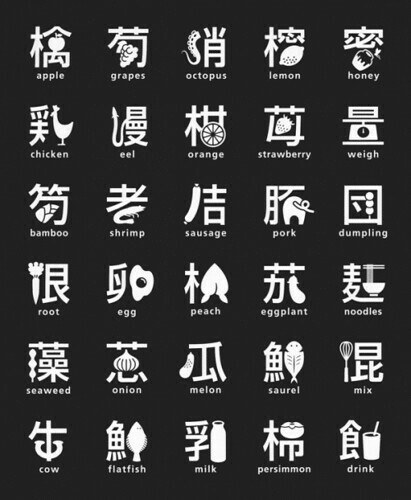 Now if the Japanese learned to write from the Chinese, why don’t the Chinese use the same iteration mark? According to Wikipedia, the Chinese sometimes use 々, but you don’t see it in print. This is true; what the Chinese use (only when writing shorthand) actually looks something like ㄣ. Ostensibly, because you never see 々 in print in China (or it never even existed in neat, printed form), it comes out a bit sloppily as ㄣ in Chinese handwritten form. 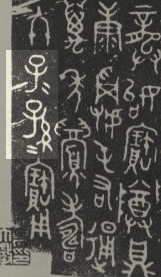 The bronzeware script on the bronze pot of the Zhou Dynasty, shown right, ends with “子二孫二寶用”, where the small 二 (two) is used as iteration marks to mean “子子孫孫寶用”. 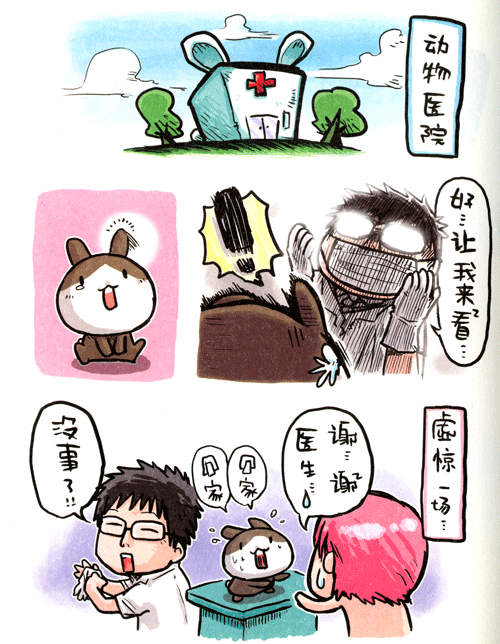 > In hospital I ran into a few Cantonese speaking patients and visitors, who in some cases spoke no English. With the luxury of ample time, I was able to say things I don’t really know how to say, by finding inventive ways to use the few words I did remember. For example, instead of asking if she’d mind opening my water bottle top because my hands were too weak and the cap is tight etc etc, I simply asked “please, can you?” and held the bottle at the top. Worked like a charm. But I’d spent half an hour agonising over the words before accepting that a simpler method was not “cheating” but rather “communicating”. > When learning a language I too often make it hard for myself by fixating on the words I don’t know rather than finding more uses for the words I do know. Lesson learned. I got my water, the “it’s a talking dog!” look, and a new friend. > My general impression is that people would enjoy foreign languages more if they didn’t have the added pressure of feeling like they are supposed to be equivalent to native speakers. You will notice that our educational system promotes this viewpoint too. We generally teach foreign languages as if learners are somehow going to be total experts some day. (Why else would we spend weeks teaching third semester college students about all of the adjective clauses that trigger the subjunctive in Spanish?) My general impression, however, is that the majority of our learners do not need to speak like undercover spies. They would be just as happy having a great time talking about sushi with Japanese friends in Japanese. I often wonder how good I want my Chinese to be. I have lots of room to expand my vocabulary and improve my ability to express myself, but there are two big questions: (1) do I really need to? and (2) do I really want to? I’ve gotta say, an unrelenting drive for perfection isn’t exactly the most persuasive linguistic motivation, and the longer I live, the more practical I become. The truth is, I’m not a terribly talkative person, and I’m already pretty comfortable in Chinese. I don’t want to be a Chinese spy (ha! 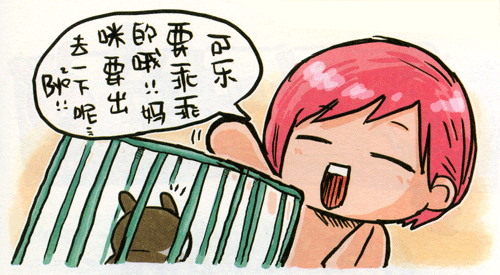 ), and I really don’t want to memorize the damn chengyu dictionary. I’d rather get my Spanish and Japanese back to levels where I’m more comfortable and able to enjoy the experience of speaking. > By the time the night was finishing up and the massage was over, it was quite late, around 10:30pm. The parents live in a slightly remote part of Shanghai, only accessible by bus or taxi, and they always refuse to take a taxi because its too expensive (even if I offer to pay). I told JJ to tell them to just stay the night at our house, that made the most sense and it was totally fine by me (and of course by JJ). We do have an extra room and I did buy this couch bed for this very reason. So it only made sense for them to stay, especially since it was holiday and JJ was not working. > We don’t know if we want to stay because the toilet paper I buy is too soft for them and they really don’t like using it. Read the rest of the post for Sean’s reaction. The type of “toilet paper” the parents prefer is called 草纸 (literally, “grass paper”), although it’s sometimes just referred to as 手纸 (which, amusingly, are the same two characters used to write the word for “letter” in Japanese). I used to use 草纸 as paper towels back in the day. I tried to find a decent picture of it online, but this was the best I could do. Remember that Indian music video subtitled with hilarious similar-sounding English lyrics? 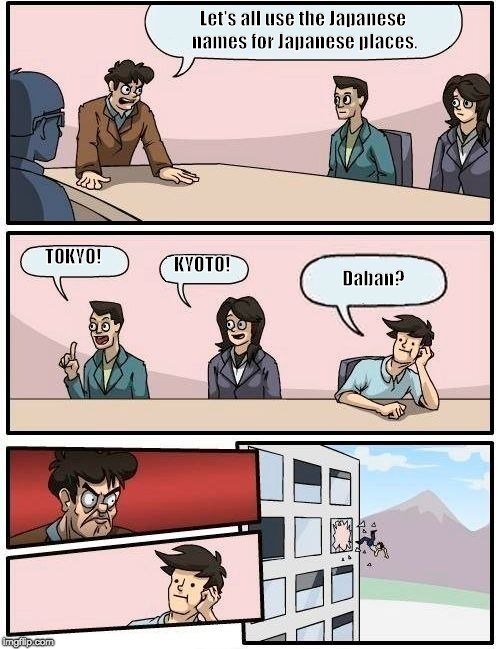 Well, here’s something along the same lines, only with Japanese and Shanghainese. The video is the theme song for a Japanese anime series called Saint Seiya (圣斗士星矢 in Chinese — apparently it’s well-known among the Chinese). This case is a little different, because the song was actually re-recorded with (ridiculous) Shanghainese lyrics. (In a karaoke parlor, from the sound of it.) 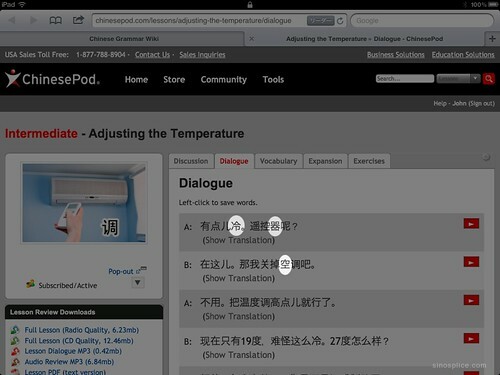 And there are subtitles for us Shanghainese-impaired! The kind subtitler put the Shanghainese “transliteration hanzi” on the top line, and the Mandarin translation on the bottom line. > Why not heat it? Here’s the original Japanese theme song. The Shanghainese version of the video was recommended to me by a local friend who said the Shanghainese lyrics sounded like the Japanese. I don’t really hear the resemblance, but it’s good wacky fun nonetheless. *Any resemblance to Beat It is unintended. I started learning Japanese in 1996. When I began learning Mandarin in 1998, I already had a foundation in Chinese characters, thanks to my Japanese studies. Learning the two languages at the same time, I was frequently annoyed by little discrepancies such as 歩 and 步, 別 and 别, 氷 and 冰, etc. Those little character details caught my attention, though. I ended up writing my senior thesis on how and why the Chinese characters of the Chinese and Japanese writing systems ended up diverging. One little detail that always nagged at me, though, was stroke order. 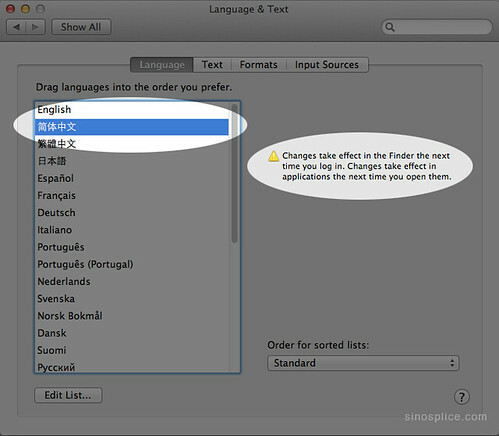 The truth is, stroke order of Chinese characters is not consistent across Japanese and Chinese. I was reminded of this recently by Tae Kim’s blog entry entitled, What’s the stroke order of 【龜】? Who cares? He brought up the stroke order of the character 必 as an example of a “weird character.” This character just happens to be one of the ones whose correct stroke order has been ever so slightly bugging me all these years. 必 is a great example, because it shows up in plenty of relatively simple words in both languages, like 必要 (necessary) and 必须 (must) in Chinese, and 必ず (without fail) and 必要 (necessary) in Japanese. 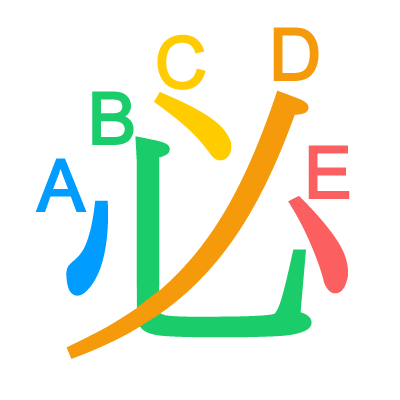 – Ocrat, MDBG, and Wenlin all say A-B-C-D-E.
– Learn to Write Characters (click on 必), maintained by Dr. Tim Xie, says A-B-C-E-D.
– A-B-C-E-D makes a lot of sense to me, because the character’s radical is 心 (but that doesn’t necessarily matter at all). 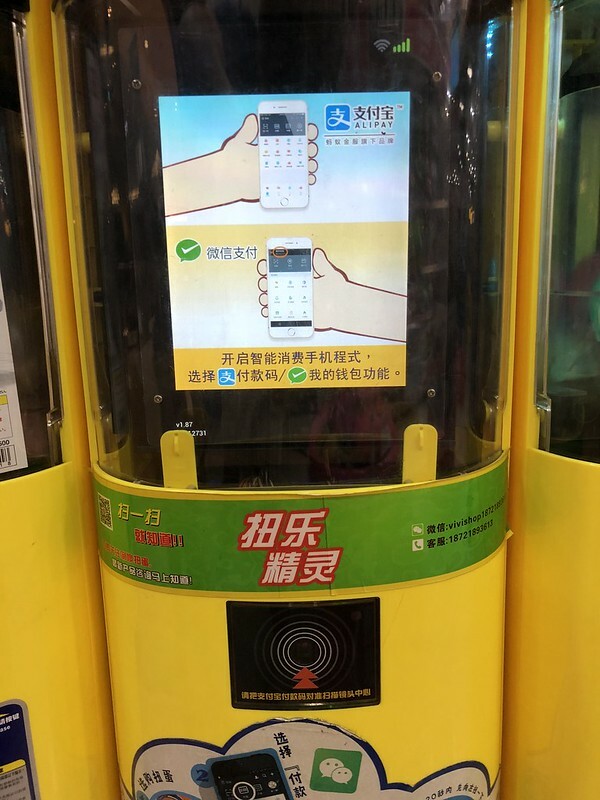 – Remember that Chinese has the added excitement of the simplified/traditional divide, as well as other regional differences in the mainland, Taiwan, and Hong Kong. – If you have more to add to this (especially from more authoritative sources). please leave a comment! – WWWJDIC, Kawatsu, Kodansha, and Gakken all agree on the bizarre C-D-B-A-E.
Hmmm, that’s a lot of inconsistency. 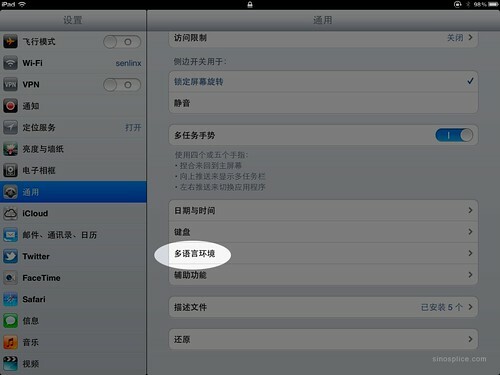 Gives you more respect for the people that can create good Chinese handwriting recognition software, doesn’t it? Note that aside from the incredibly common 出, the heart radical 忄 — a component of tons of very common characters — is also among the ambiguously stroke-ordered. 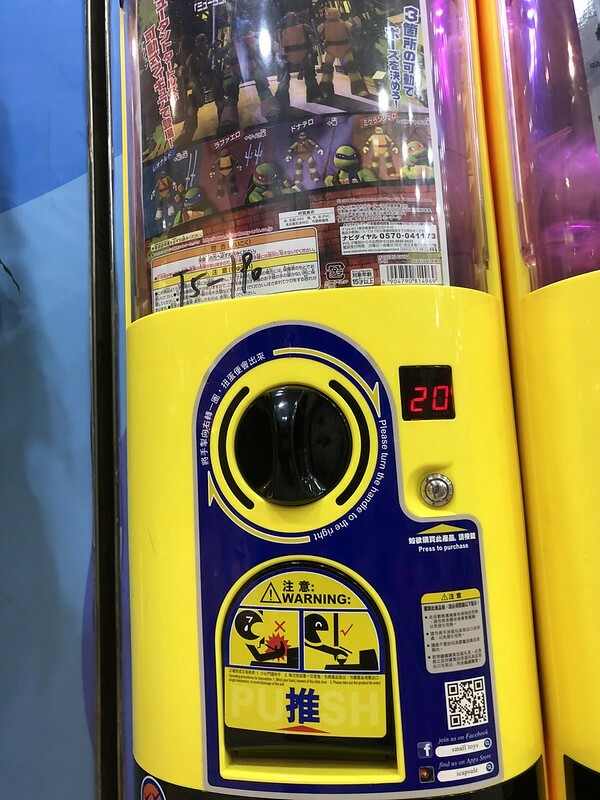 Notice too that the Japanese-only variants are not included in this list. – Chinese character stroke order is fun! Like me, you may be bugged by these inconsistencies. 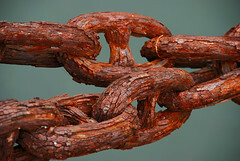 You may feel compelled to seek out some underlying pattern or just memorize a big list of exceptions. Don’t do it! Be satisfied with a quick look over the chart above. Just get the non-exceptional stroke order basics down and you’ll be fine, trust me. Don’t obsess over perfect stroke order and all the exceptions, because it’s an imperfect system. The deck is stacked against you. Learn to read and use characters to communicate, and you win. I’ve lived in China for close to a decade now, and I’m much more comfortable with Chinese, even if I once majored in Japanese. When I arrived in China in 2000, though, my Japanese was much better. At the time, some people used that slippery term “fluent” to describe my Japanese speaking ability, but I definitely wouldn’t get that compliment now. What happened to my Japanese skills is not as simple as plain neglect, however. During my first few years in China, I made several visits to Japan. While I practiced Japanese very little in China, I was determined not to just “let it go,” and I was able to retain a lot of what I had learned. The big problem, though, was that I wasn’t practicing. Why not? It’s not because I never met Japanese people in China. The real answer may sound a little strange. I had struggled hard for my right to speak in Chinese here in China, and I was sick and tired of people trying to use me for English practice. I just couldn’t bring myself to pester Japanese people in the same way. I didn’t want to be perceived as another user. Still, the end result has been the loss of many Japanese speaking opportunities, potential Japanese friends, and communication in Japanese. 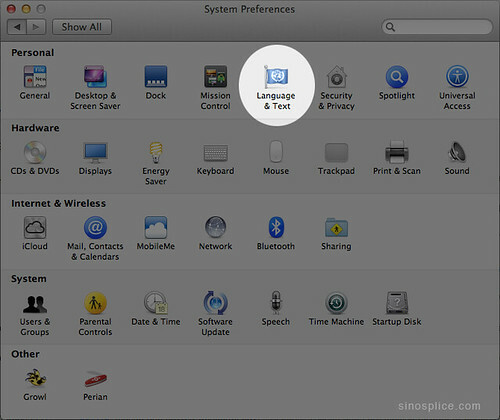 I am reminded that a good language learner needs to be adventurous, friendly, bold, and… not so damn sensitive. P.S. 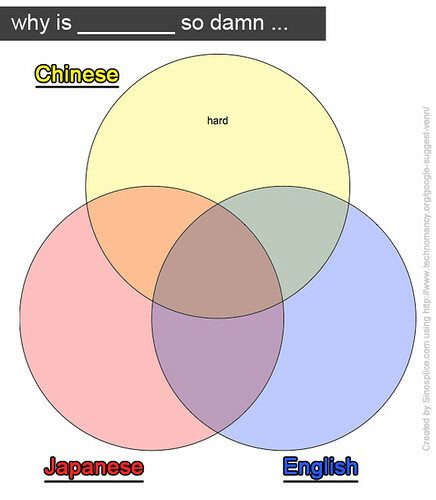 Be on the lookout for the upcoming Language Power Struggle intermediate lesson on ChinesePod — inspired by true events!